If you hear weird noises in your attic late at night or you see what looks like animal droppings in your attic you may have bats! Don’t be too alarmed, but understand that bats are not something that you should take lightly. It’s important when you first suspect that you have bats that you call a reputable bat exterminator in Andover MN like Minnesota Wild Animal Management, Inc. 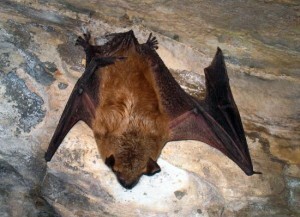 Bats are often thought of as dangerous because they carry rabies. While this is true, there is a lesser-known danger of bats that is not so easy to avoid. This danger is a disease called Histoplasmosis, which you can get from exposure to bat droppings also known as bat guano. Histoplasmosis can be contracted from airborne spores that are released from bat guano when it is disturbed. Think about being in your attic and cleaning out old junk not realizing that you are being exposed to this disease. Another common way to contract this disease is if the spores enter your ventilation system and are cycled throughout your house. If you contract Hisoplasmosis you often will come down with flu-like symptoms such as a headache, cough, chest pain, fever and even joint or muscle pain. These symptoms are somewhat vague and can often be mistaken for something else entirely. Many people will simply get over this disease while some have been known to develop long-term illnesses. This is especially the case if you have a weakened immune system. As you can see, bats are no laughing matter. If you think you may have bats in your home it’s best to call a company providing complete bat removal Andover MN. At Minnesota Wild Animal Management we not only offer complete bat removal, but we also will assess your home to address preventative repairs that may lead to a bat infestation down the road. Bats love to enter homes through rotten siding, fascia or soffit boards as well as roof vents. Keeping these areas free of wood rot as well as adding screens behind ventilation vents to prevent bats from entering your home can be a great way to avoid a bat problem at your home. If you think you’re home is infested with bats or if you just want to have someone perform preventative repairs to ensure you won’t ever have to deal with bats, give the bat removal experts at Minnesota Wild Animal Management Inc., a call today at (612) 237-8282.